Mark Cuban's comments on tanking cost him $600,000 and apparently his players didn't get the memo after applying all the stress possible to make every member of the Thunder bald prematurely. 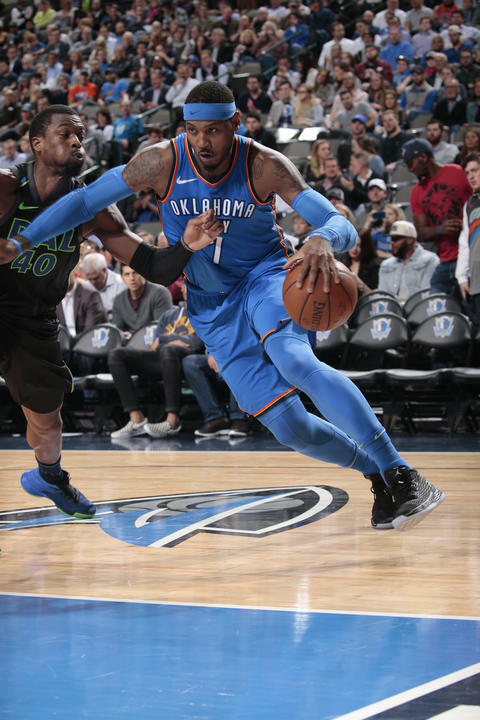 Entering Wednesday night's matchup, the Thunder sat seventh in the Western Conference and in a very sticky situation. They were just 1.5 games ahead of the ninth-seeded Denver Nuggets but also 1.5 games behind the fourth-seeded San Antonio Spurs. That's how close the conference has been. With that being said, you'd assume a team with a substantial amount of experience would understand the meaning of a road game against a team with a (19-42) record, right? Unfortunately, that wasn't the case as the Thunder allowed Dwight Powell, Dennis Smith Jr., and Harrison Barnes to combine for 64 points en route to an electric and heated overtime battle in American Airlines Arena. Those three looked just as much of a big three as Russell Westbrook, Paul George, and Carmelo Anthony, who combined for 65. Sixty-five points between OKC's head honchos definitely isn't a bad look. That's 21.6 points per person, but the simple fact that defensively, the Thunder as a unit allowed three guys with 10 years of collective NBA experience out-play and excel against them is an utter embarrassment. Where's the urgency? The laissez-faire, "we'll figure it out," attitude is a broken record. Although the Thunder continue to compete and often times defeat the NBA's best teams, a consistent habit of winning needs to be developed before the big show that we call the NBA playoffs commence. Of course, for chemistry purposes. Photo: Glenn James/ Getty Images. Being extremely familiar with the culture of basketball and the mind of a basketball player, no real competitor likes to lose. Westbrook has said it multiple times throughout his career. Whether they play well consistently against the best teams or not, these narrow wins and often times losses to subpar competition truly does affect these guys. It affects the team's chemistry. Don't let these interviews fool you. Through the remaining 19 games, the Thunder only face five teams with a losing record. The other 14 feature tough home matchups against the Spurs, Houston Rockets, Los Angeles Clippers, Miami Heat, Portland Trail Blazers, Denver Nuggets, and one last regular-season matchup against the Golden State Warriors. The road games aren't any easier, having to travel to Portland where they haven't won in seemingly forever, Toronto, Boston, San Antonio, New Orleans, Houston, and Miami. So based on the trend of this inconsistent, backward season, the Thunder may just come out alive with a respectable seed in the playoffs. However, the inconsistency surrounding this them is troubling. There's honestly no way to know what team may step out on the court and hopefully, that doesn't hurt this team's chemistry or energy level heading into the most important juncture of the season.